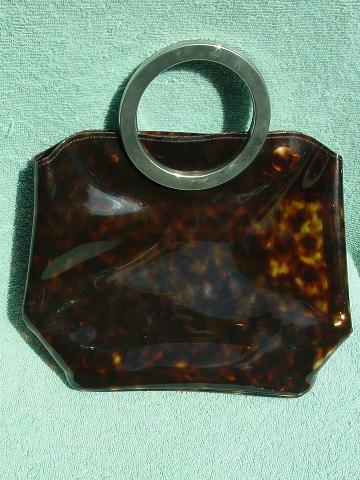 This see-through vinyl/plastic purse is in a brown tortoise pattern. The top closes with 2 magnetic snaps and the 2 silver-tone handles are in the shape of circles. A model, who wore it for clubbing in Miami, got a real tortoise purse and decided to sell this one. The open handle area measures 2 3/8" high by 3 1/2" wide.